Medici family tree – Interactive! 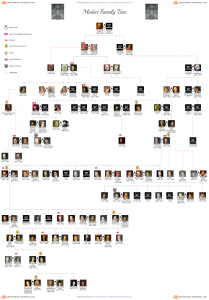 Welcome to my clickable Medici family tree. I hope this resource can help you with your work, your research, your trip to Florence Italy or just your curiosity about the patrons of the Renaissance. Click on images in the Medici family tree to open the relevant articles. My Medici family tree starts with Giovanni di Bicci. That’s the man you’ll find on top of most of the similar resources. We have scarce information on the Medici family before Giovanni, but more than this, the main reason is that with Giovanni, the Medici family starts to be important for Florence, and if you didn’t notice, this is a blog on Florence. For this same reason, I didn’t care to add the descendants of the two Medici Queens of France. 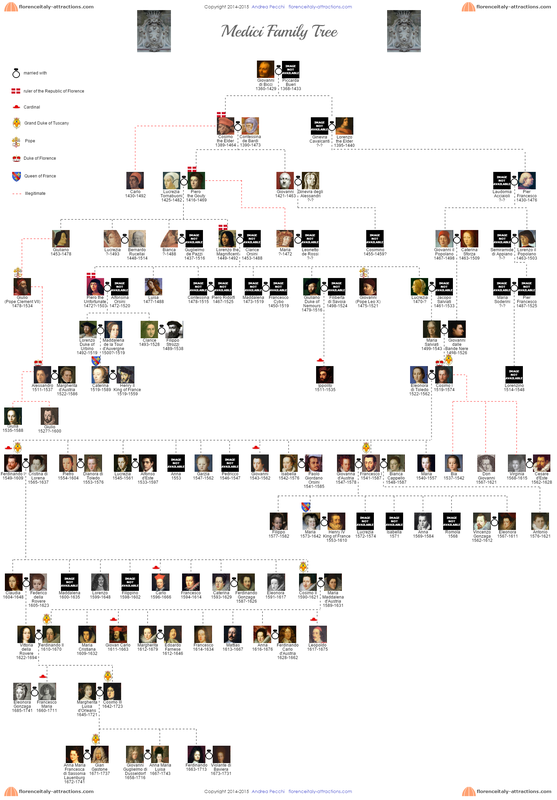 I plan to make a Medici family tree “before Giovanni”, along with some other similar projects, so come back often to check and get some clue on the origins of the family. Note on the pictures: all the pictures are portraits of the members of the family: there are paintings, drawings and sculptures. Some of them are parts of famous works of art that maybe were modeled on a member of the Medici family. When this is the case, you’ll find more information clicking on the related link. Some images are not available, as you probably noticed: this is because of various reasons; most of the times, no portrait exists; other times, I didn’t find one so far. The fact the image is missing doesn’t necessarily mean that there is no link. We have members of the family with a picture but no link as long as members with no picture but a link, so just explore the infographic and click around to find the info you need. My website layout is responsive and the infographic is 1600 pixels wide. I noticed that when it zooms out to fit smaller screens, some of the elements overlap or slightly change their location. I’m sorry for this, but there’s no way that I know to solve this issue at the moment. Only thing I can suggest is to click on the thumbnail below and see the infographic as picture (with no links). Doesn’t load correctly on your phone? Try this link, or load the tree as image (not interactive) and zoom in. hello, i am studying the Medici family for my DISSERTATION and i am using your family tree as a baseline for it i have two questions…. 1. if the persons name is just their first name are they name de’ Medici?